The weather improved. It was a beautiful day. Emboldened by this Mr. Waffle and I decided to explore the resort a bit further; a decision we frankly regretted as we were exhausted by the end of the morning; had missed our regularly scheduled cup of tea; and inadvertently done a couple of red runs (not for us the daring of my nephew who completed a black run very handily as my brother-in-law showed us on his phone, it only occurred to me some time later that my brother-in-law, by far the best skier in the group, must have followed his son down at a fair old clip while filming. Frankly, the horror). 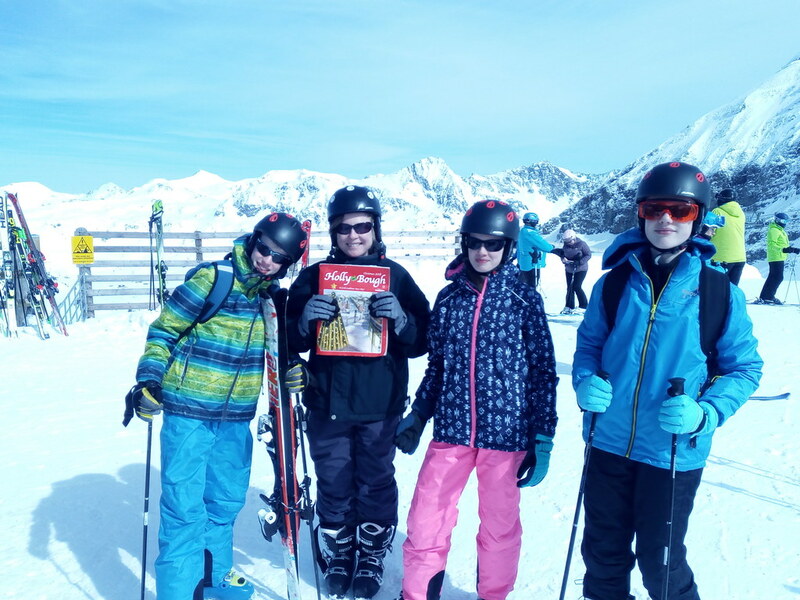 All three of the children meanwhile had a very successful morning at ski school and Dan’s knee was entirely recovered. My own knee was starting to act up a bit on foot of the unaccustomed exercise regime it was enjoying. We had an expensive and slightly unsatisfactory lunch involving venison burgers. After an afternoon of achievement we stopped for a well deserved cup of tea in the Austria Inn. The staff were a bit surly and when I asked whether we could order from them, one of them eyed me dubiously and said, “It would be easier if you ordered from the bar.” “Clearly for him yes but not for me,” I thought bitterly as I clumped out from the bar with tray of drinks. As we sat enjoying our drinks, I saw a woman of slightly similar dimensions to my own edging her way precariously and quite gingerly to the ski lift as though she had never been on skis before. I noticed she had the same skis as me, “I bet those are the skis they rent out to mediocre fat lady skiers,” I said gloomily. We finished up to be on time for the last lift back to our side of the mountain. “Where are my skis?” I said, looking anxiously at the carousel where we had left them. “There,” said Mr. Waffle. “They’re not my skis,” I said. “They must be, they’re the only set left.” I took them down and noticed they were stuck in the snow one ski up and one ski down. I looked again. I tried them on. The bindings fitted; they were similar in colour; they had the ski hire place name on them, but yet. Anyhow, there was no other way home, so off we trotted. On the lift I looked at them more closely and said, “I think fat lady took my skis.” The others laughed at me. But yet. When we got back to the ski locker, I checked photos from earlier in the week. Were they my skis, gentle reader? They were not. Much grief and heartache ensued. It turned out that fat lady’s skis were ex-hire skis from the year before and I had to turn them in to the ski shop to hand over to the police. I then had to pay the ski shop €270. As herself said sympathetically, “It’s like having to buy skis without getting any skis.” Sigh. Mr. Waffle and I trudged back to the Austria Inn to see whether my skis had been mysteriously returned but no. The children meanwhile were having a great time. Before dinner, Daniel and Michael went swimming with their cousin J while all the girl cousins (nearly 16, nearly 11, nearly 2) hung out together. My children were unfeasibly excited by the discovery that they could charge drinks to their rooms. Late in the holiday was a good time for them to discover this. After sending off the children to ski school we went off to the police station to declare the lost skis. The policeman felt our claim was a lot of paperwork – what if the skis turned up (spoiler, they didn’t) – but we needed it for insurance so we insisted. “I bet this never happens!” I said in my best Leaving Cert German. “Every day of the week,” he said dourly. I had my PSC card with me which is not perhaps the most loved Irish piece of documentation and so far has only been useful to me for picking up parcels from the post office, but the Austrian policeman unbent visibly when he saw it and picked it up with a fond smile. Papers, what’s not to love? We ran into my sister-in-law and baby S in a ski buggy which they got from the hotel and I had my most successful interaction ever with S by hiding behind a large glove puppet. It may not be a sustainable long term strategy for building our relationship. We met the children after ski school and went up the cable car and had lunch at the top. We got some great photos with the Hollybough. I’m hopeful we’ll make the cut this Christmas. Just saying. Then we all skied back to the hotel together. We met with middling success. The top was a bit on the steep side and the descent was slow and careful but it picked up after a bit. Michael and I went back to the hotel to recover after the arduous descent. Then I went out for a bit to a nice tame run with herself (who became unstoppable over the course of the week) and my sister-in-law. Then back to the pool and dinner. The children played a complex card game which Michael had brought out to Austria from home. My niece G was so enthusiastic that I heard her ask Michael whether they could play again at breakfast. This, this is the core objective of family holidays; for your children to get a chance to play elaborate games with cousins who are, crucially, faster on the uptake and more enthusiastic than parents. The boys got the bus to ski school but the Princess was keen to ski across and I accompanied her. Mr. Waffle joined me shortly afterwards and the pair of us did a bit of skiing near the children’s ski school and did a couple of new runs which was very pleasant. Then we had a nice cup of tea up the mountain and headed home to meet the children from ski school. I got a text message from herself “I’m going to ski home from the top of the cable car lift, don’t panic.” I would have but I hardly had a chance as she arrived two minutes after the bus disgorging her brothers arrived. We went for lunch across the road from the hotel in a related establishment where we should have gone sooner as it was handy and pleasant. In the afternoon the whole group, except for my sister-in-law who was confined to barracks minding little S, went and did some easy runs together. My brother-in-law took my nephew off to tackle a black run and while he was gone the two girls were keen to go on what they assured me was a straightforward red. As a grown-up I felt honour bound to go and check it out with them which, in retrospect, was a pity as only one person fell over on that run and it wasn’t either of them. Still the snow was soft and slushy and the only injury was to my dignity. 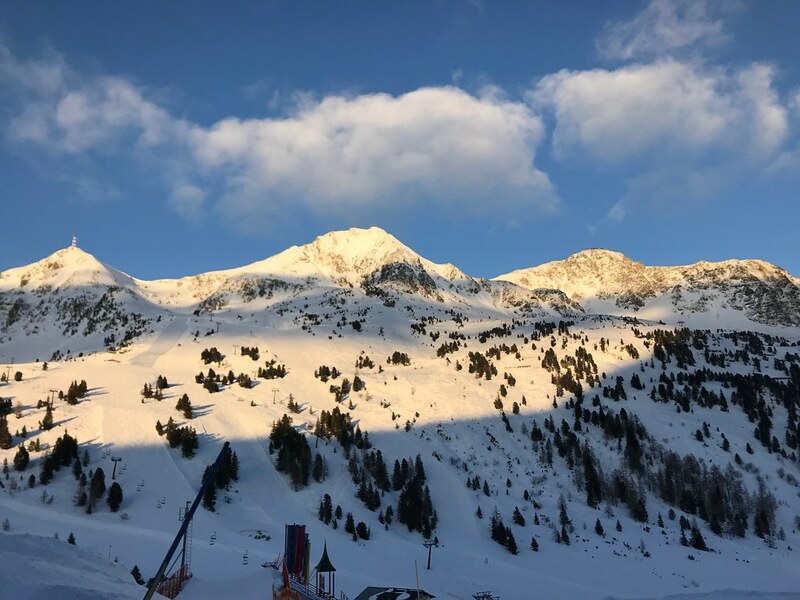 My brother was skiing in France at the same time and he sent the photo below to cheer me. It was effective. I have to say, I would love if he could come with us next time we go because even though he drives me crazy, he’s great fun on holidays and he’d be able to keep up with the children who are going to be far better than Mr. Waffle and me very soon. So, on to our last dinner. I was sad. More particularly so when I discovered that we had lingered so long over dessert that the cheese buffet which I had loved every other evening had been put away. Oh the cheese buffet. So would I do it again? Like a shot; it was great. Are my knees convinced this is wise? Not entirely. Will I be saving up to pay for it? All year.